The Treble Makers are an award-winning a cappella vocal quartet based in Northamptonshire, of whom three out of four are current All Saints singers. The group was formed by bass Alistair Donaghue in September 2012 with the idea of performing at weddings, concerts and birthday parties. They have since done all this and more, including winning the district final of the Rotary Young Musician of the Year competition 2013, singing live on prime time BBC radio and gaining a monthly paid slot at Northampton’s ‘Black Bottom Club’ with their superb renditions of Brown Eyed Girl, Fix you and Katy Perry’s Firework amongst many others. repertoire, ranging from Thomas Tallis to Jason Mraz, as a result of their many musical influences. 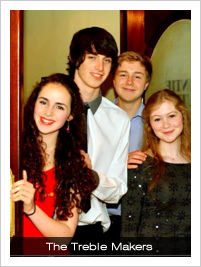 All four Treble Makers sing in the Northamptonshire County Youth Choir which specialises in popular contemporary music, and Eleanor Fox (soprano) and siblings Holly (alto) and Alistair Donaghue are choristers at All Saints’ Church, Northampton. James Coe (tenor) is a choral scholar at St. Giles’ Church, Northampton. As well as singing adapted Real Group and Kings Singers arrangements, both Alistair and Eleanor regularly arrange music for the quartet in order to keep up with the Top 40! 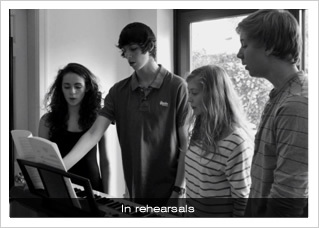 sing at Birmingham Conservatoire in September 2013.